Inflatable tee ball is an inflatable game for kids, especially young kids whose ages between 4 years old to 8, to start learning and playing simple baseball or softball. 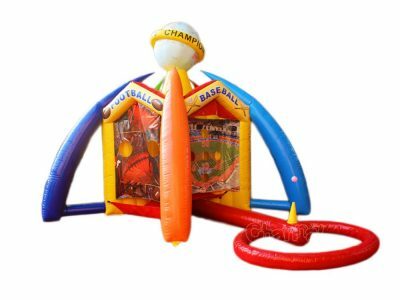 Inflatable t-ball game mainly contains 2 part, one is the tee base made of air tube, the other is the blow up baseball cage with baseball scoring painting. The cage also makes sure all balls be strike remain in the structure for next uses. How do kids play inflatable teeball? They aim and bat the balls floating on the tube tee to the opposite goals, try to score higher points. The aiming is a bit challenge for little children batters, because those air baseballs do not stand still, they are constantly wagging and moving by the air blown from the tee. 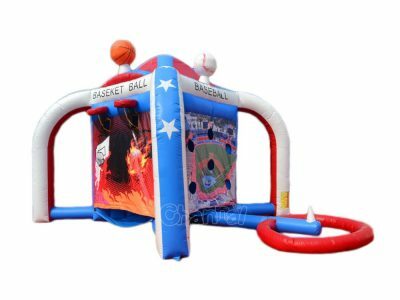 Inflatable tee ball sounds fun for kids to practice their batting skills, it will be a popular game in any backyard party and carnival. 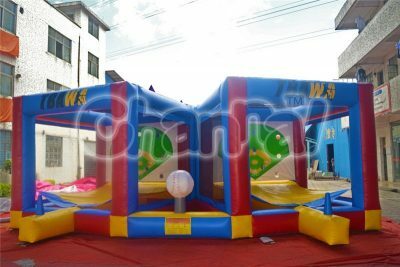 Channal Inflatables is a professional inflatable T ball game manufacturer in China. Contact us for making your own inflatable baseball game at a good price.